MLB All-Star Juan Soto lost a potential three run home run when his fly hit the Tokyo Dome roof, turning into a routine "ground rule out" when Samurai Japan caught the ball, cuing Don Mattingly and 1B Umpire Eric Cooper to have a brief conversation about the perils of playing in a domed stadium. Spoiler: Coop & Crew got the call right. Kobayashi explains the catch call to Don. The Play: With one out and two on (R1, R2), in the top of the 4th inning of Game 3 of the best-of-five MLB-Japan All-Star Series, Soto hit a fly ball into deep right field that caromed off one of the white panels that comprise the stadium's high ceiling and into RF Shogo Akiyama's waiting glove, on the warning track just shy of the wall. The Call: Cooper ruled Soto out, the second out of the inning as opposed to a three-run home run. 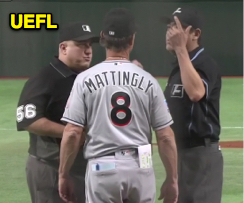 After convening HP Umpire Kyohei Makita, 2B Umpire Kazuhiro Kobayashi, and 3B Umpire Quinn Wolcott, Cooper affirmed his original ruling and maintained the out call. For an illustration of the Tokyo Dome ground rules, we visit the former Major League stadium in Minnesota, the Hubert Humphrey Metrodome (the Met and Tokyo Dome share iconic design elements, including the iconic paneled dome cover). Let's just say the rules are a lot easier to comprehend in these domes than Tropicana Field's catwalk system in Tampa Bay. Ball Strikes Metro/Tokyo Dome in Flight and Falls Back into Play: Live Ball. Eddie Guardado catches a deflected fly ball. When Minnesota's Randy Bush hit a fly ball off one such panel at the Metrodome in 1983, Toronto's Buck Martinez was able to adjust and catch the batted ball in foul territory for an out. The same thing happened to Detroit's Rob Deer in 1992—twice!—with Minnesota shortstop Greg Gagne catching both for outs. And then there's the infamous Chili Davis fly ball that hit a hanging speaker and was caught by Baltimore's Mark McLemore, or Eddie Guardado's even more notable diving catch on a fly ball that deflected off another such speaker. Related Video: Pitcher Guardado races off mound and dives to make the catch in foul territory. Related Video: Greg Gagne hits two inside-the-park home runs thanks to the Metrodome roof. Ball Strikes, and Remains, in the Space Between Two Panels: Double (if Fair), Foul (if Foul). Shohei Ohtani's perfect hit turned into two. This scenario doesn't happen all that often, but because of the unique system of panels that comprise the pressurized domed roof, a baseball can get lost between the tiles and come to rest in the roof itself. If this happens, as it did to Shohei Ohtani playing for Team Japan against Team Netherlands in the World Baseball Softball Confederation's Global Series 2016, the official ruling is a ground rule double for the batter. Oakland's Dave Kingman did the same thing at the Metrodome on May 4, 1984, and was similarly awarded two bases. Related Video: Shohei Ohtani hits ball through the roof at Tokyo Dome!! SIDEBAR: These are real "ground rule doubles," opposed to those commonplace batted balls that land on the field before bouncing over the wall and into the stands that lay-folk like to call "ground rule doubles" (they're "rulebook doubles" or "two-base awards"). In conclusion, no, there is no Replay Review in the MLB-Japan All-Star Series, but even if there was, Cooper's call would have been confirmed: that's a live ball and a catch—a ground rule out if there ever was one.